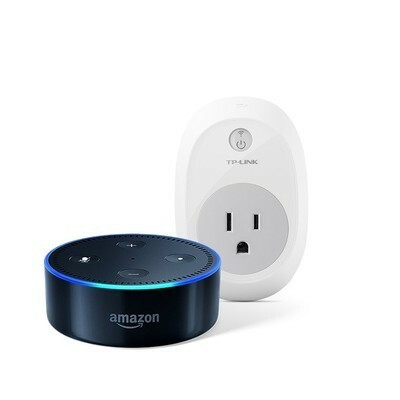 As part of its Gold Box deals of the day, Amazon has an Echo Dot and TP-Link Smart Plug combo for just $50.98, a savings of $39 from their regular pricing. These items normally sell for around $50 and $40 respectively, but both are currently on sale for a bit less. Even compared to the discounted pricing, this bundle still saves you an additional $9 off and makes for easily the best Echo Dot combo we’ve seen lately. The Echo Dot can be used to control the smart plug, and so much more. You can use it to set reminders, do simple conversions, play music, and even make calls. TP-Link’s smart plug can be controlled from anywhere in the world using the free iOS and Android apps, and you can even set a schedule for the times you are away and want it to appear like you’re still home. If you’ve been wanting to give the whole smart home thing a shot, this is definitely a great way to get started. Keep in mind that this pricing ends when the day does, so you won’t want to wait too long before getting your order in.